It's no secret that we think everyone should bike to work. We live and breath this stuff. So we thought it was time to share the knowledge we’ve gained from thousands of commuters. This guide was put together from our customer survey data, industry research and decades of bike commuting experience. Pedal forward with confidence. What kind of bicycle is best for biking to work? What do I need for accessories on my bike? What kind of panniers and bike bags should I use? How far is the typical bike ride to work? How long does it take to go 8 miles (12.8 km) on a bike? How do I plan the best bike route? What should I typically pack when biking to work? What essential bike tools should I pack? Where should you park I bike? Biking to work with no shower? Where can I find more answers to commuting questions? Bikes come in all shapes and sizes and there is a justification for riding them all. However, the majority of commuters ride a hybrid or commuter bike to work. These are a blend between road bikes, touring bikes and mountain bikes. Hybrids offer the best all around attributes for a wide variety of weather and road conditions. They balance comfort and speed and are generally more affordable than road or mountain bikes. Just like cars, bikes need regular maintenance to keep you safe and riding smooth. There are few sweeter pleasures than riding a freshly-tuned commuting machine. Take care of your chain, brakes, tire pressure, spokes, gears, headsets and wheels. Show your bike some love with a professional tune up ($30-$75) or do it yourself regularly throughout the season. What accessories do I need for my bike? People like to get hung up on this. But the truth is, you really don’t need anything special. 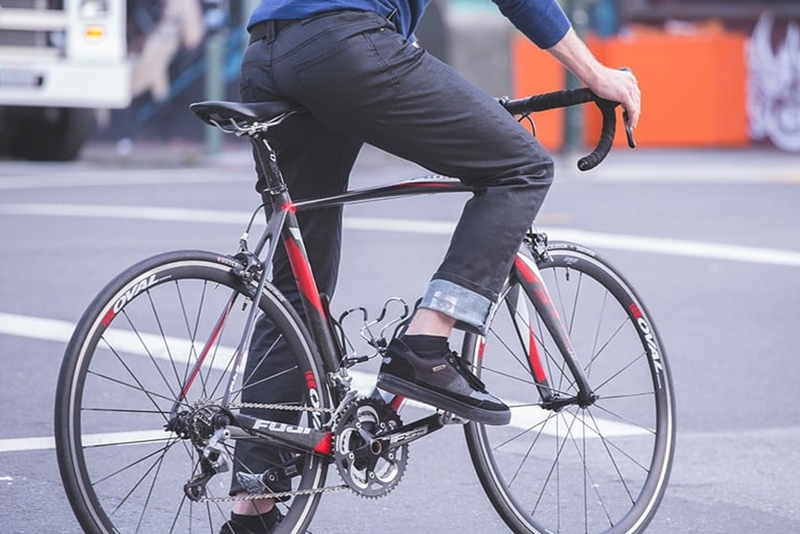 No lycra required for daily commuting (unless you’re into that). A pair of comfortable shorts, solid sole shoes, helmet, and sunglasses is a good start. If you bike in the shoulder seasons, you may also want to invest in a good waterproof jacket and waterproof pants. Add in a pair of light cycling gloves when it starts to get chilly. If you continue biking through the winter, consider a pair of insulated cycling pants, winter mitts, toque/beanie for under your helmet, winter jacket and even a pair of ski goggles if it gets really hairy. 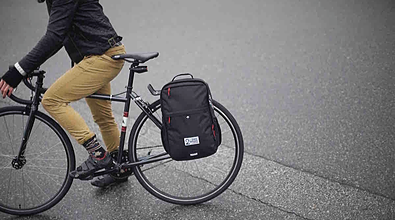 A bike bag that attaches to either your front or rear bike rack. (We make these!) You need to have a bike rack installed to use panniers but they are a relatively inexpensive and simple accessory to add to most bikes. Panniers carry the load and free the rider from sore, sweaty back syndrome. What are the best panniers or bike bags for commuting? We’re glad you asked! 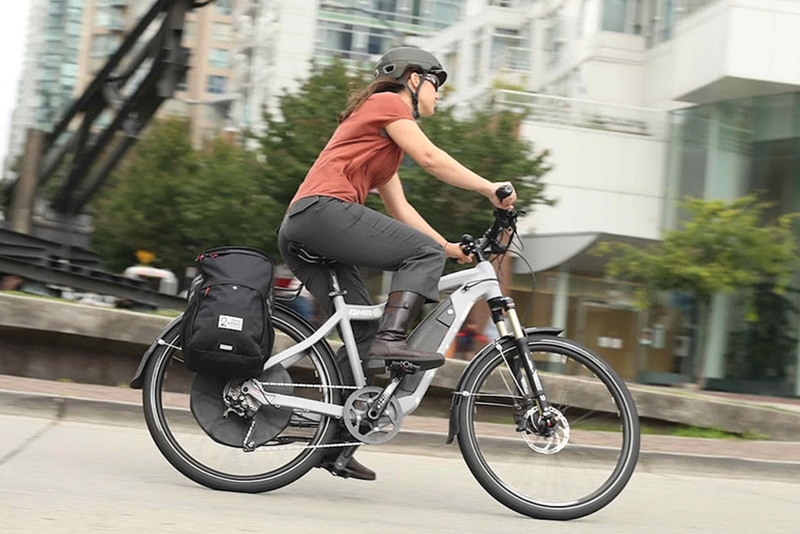 We specialize in a few different types of hybrid panniers for biking to work. Here are two of our signature bags created specifically for the commute. The business professional's bike bag. A cross between a traditional travel garment bag and a double sided pannier. Keeps clothes wrinkle-free and organizes everything from laptops to shower gear. The bike commuter's backpack. Converts to pannier in seconds for on bike carrying. Organized pockets protect your laptop and work gear. Waterproof materials for all weather commuting. Created in San Francisco to give traditional bike messengers the flexibility to quickly swing the bag around when delivering packages. One shoulder takes the brunt of the weight. We recommend taking the load off the back altogether and going with a pannier option. Yep, any old backpack will do the trick! It really doesn’t get more simple for starting out. As you ride more often you’ll want to find better carrying options. Thats where we come in! You can put just about anything in here but you might spend some time looking for it. Most standard panniers lack organization and dedicated compartments for your important stuff. They also are a real pain to carry around off with the bike with the majority only having a small handle at the top. Baskets will typically attach to the front of your handlebars. They are functional for transporting groceries, small bags and loose items. However, they are unprotected from the weather, your cargo is not secured and they aren’t great for carrying other than at the local farmer’s market. Mainly used for bicycle touring, bike camping and mountain biking. These bags are super flat as to not interfere with your legs or pedals. Sometimes tricky to find the right bag for your particular bicycle frame and not the best solution for general purpose commuting. Great for stashing extra gear on the long haul but not handy for frequently taking on-and-off the bike. Storage capacity is limited for daily work items. Handlebar bags are easy-access, portable, and convenient. But they are small. Best used for small tools, personal items and complimented with a larger, more robust pannier or bike bag. Rear trunk bags sit on top of your rear rack. They are like a mini duffle bag that attaches underneath the top deck of your rear rack. Generally quite small and mostly used in a bicycle touring setup. Not known for quick dismounting off the bike and won’t hold larger items like laptops. Crates are pretty handy if you are hauling cargo (or beer!). You’ll see many do-it-yourself models of bikes rigged with plastic milk crates and bungy cords. However they also scream “I’m too cheap to buy anything good.” At their core, they might be the simplest form of carrying stuff on your bike. Handy little bags that attach under the back of your saddle. Most regularly used by road cyclists for keeping the load light and packing only essential tools for serious training laps. If you forget about this one (which is easy to do!) you’re likely missing your expensive tool or bag altogether when fully caffeinated and ready to get back on the road. According to our research, the average Two Wheel Gear commuter rides about 8 miles (12.8 km) one way to work. How long does it take to ride 8 miles (12.8 km) on a bike? Every rider, route and bike is different. But on average you can expect 8 miles to take about 40-45 mins on your bike. How to plan the best bike route? What should I pack when biking to work? Pack everything you need to get showered and prepared for the day in a Garment Pannier. Pack a little more casual. A light change, laptop, work items and tools in a Pannier Backpack. What are the essential bike tools to have handy? Where should I park my bike? Ideally, you may have access to bike parking in your building’s parkade. Find out! Invest in an annual bike stall if possible. Bring your bike into your office or park outside in a public place. For tips on parking your bike check out the Bike to Work Blog. If your workplace doesn’t offer shower and change room facilities, you still have options for getting cleaned up once you hit the office. 1. Find a gym nearby your workplace that does. A lot of commuters stop at their local YMCA or gym before work. You can shower and sometimes even lock your bike there for the day. Then casually stroll over to the office feeling like a million. Many cities are also starting to offer cycling centers that boast bike lockers, repair centers and shower facilities that can be joined for various membership periods. Google search your city! 2. The ol’ showerless wipe down. This one is self explanatory. You can pack a small towel or wet wipes to give yourself a spruce up in the bathroom. 3. Multi-Modal Transit. Investigate if you can take your bike on the train or bus for a portion of the ride. This significantly cuts down on the amount of work (and sweat) required to complete the trip. You might even be able to wear your work clothes on the commute. Check out the following bike community forums for every question possible. If your’s isn’t listed...ask it! Ready to get the wheels rolling and put your bike into action? Receive a monthly dose of inspiration and never release a product release or insider deal. Have something to add? Share your bike commuting wisdom in the comments!